In 1875, Friedrich S. Merkel first described human Merkel cells. The term Merkel cell carcinoma (MCC) was first used in 1980. MCC is a primary intra-dermal tumor, of neuroendocrine origin, seen mostly in Caucasians above 50 years of age on sun-exposed areas. It is a rare tumor of the skin with a very poor prognosis. We report a rare case of MCC in a 33-year-old man who presented with acute bleeding from an ulcerated mass, which was promptly excised with wide local margins. In spite of the relatively aggressive nature of this neoplasm, the patient did not manifest any recurrence over the last 4 years of follow-up. A 33-year-old man presented with a painless, slowly growing mass over the right upper chest wall of 4 months' duration which had spontaneously ulcerated and started bleeding on the day of presentation. There was no recent history of trauma, pain, fever, or weight loss. On examination, the patient was of average build and nutrition. There was a well-defined, firm, globular, non-tender mass approximately 2 cm in diameter over the right anterior axillary fold. The mass had a smooth surface; it was not fixed to the underlying structures but was fixed to the overlying skin. There was an ulcer at the center of the lesion about 0.5 cm in diameter. The ulcer had rolled-up margins, indurated base, and the floor had adherent clot. There was no clinically apparent regional lymphadenopathy. Routine and laboratory studies including coagulation profile were unremarkable. Serological tests for HIV were nonreactive. Skiagram of the chest showed no abnormality. The history and the clinical findings suggested a neoplastic lesion arising from the skin and hence, a wide local excision of the lump with 2 cm margin all around was decided upon promptly. The deeper plane of excision was just superficial to deep fascia. Cut surface was heterogeneous with cystic areas filled with blood. 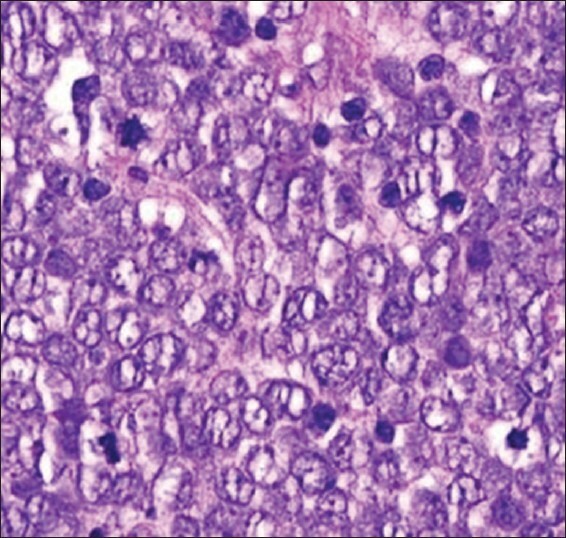 Histopathology showed a monomorphic appearance with uniform round cells having scanty amphophilic to eosinophilic cytoplasm with vesicular basophilic nuclei with prominent nucleoli, fine granular apoptotic bodies, and mitotic figures in plenty. The lesion was well vascularized and showed areas of hemorrhage [Figure 1]. Immunohistochemistry report showed the tumor to be cytokeratin-20-positive and S100-negative, suggesting it to be MCC. The patient did not receive any other adjuvant therapy. He is being regularly followed-up for the last 4 years and is doing well so far without any evidence of local or regional recurrence. MCC is an unusual skin malignancy, which is often confused with amelanotic melanoma. MCC lacks distinctive clinical features, and as such it is difficult to diagnose clinically. By the time the diagnosis is made most of the tumors have metastasized to regional lymph nodes. Differential diagnoses include basal cell carcinoma, lymphoma, melanoma, and squamous cell carcinoma. Aging, sun exposure, and immunosuppression are recognized risk factors. None of these risk factors was present in our patient. Immunohistochemistry is required to diagnose MCC, as histopathology can only point to malignant round-cell tumor. On histopathology, the triad of vesicular nuclei with small nucleoli, abundant mitosis, and apoptosis is only suggestive of MCC. Patients presenting with nodal involvement or clinically evident systemic spread need proper radiological staging. In this reported patient, prompt and radical surgery proved to be curative. He was not administered any other adjuvant therapy and there has not been any recurrence, either local or distant, over the last 4 years' follow-up. 1. Merkel F. Tastzellen und Tastkörperchen bei den Haustieren und beim Menschen. Arkiv für Mikroskopische Anatomie und Entwicklungsmechanik 1875;11:636-52. 2. Johannessen JV, Gould VE. Neuroendocrine skin carcinoma associated with calcitonin production: A Merkel cell carcinoma? Hum Pathol 1980;11:586-8. 3. Feng H, Shuda M, Chang Y, Moore PS. Clonal integration of a polyomavirus in human Merkel cell carcinoma. Science 2008;319:1096-100. 4. Yiengpruksawan A, Coit DG, Thaler HT, Urmacher C, Knapper WK. Merkel cell carcinoma. Prognosis and management. Arch Surg 1991;126:1514-9. 5. Hitchcock CL, Bland KI, Laney RG 3 rd , Franzini D, Harris B, Copeland EM 3 rd . Neuroendocrine (Merkel cell) carcinoma of the skin. Its natural history, diagnosis, and treatment. Ann Surg 1988;207:201-7. 6. Bobos M, Hytiroglou P, Kostopoulos I, Karkavelas G, Papadimitriou CS. Immunohistochemical distinction between merkel cell carcinoma and small cell carcinoma of the lung. Am J Dermatopathol 2006;28:99-104. 7. Poulsen M, Rischin D, Walpole E, Harvey J, Mackintosh J, Ainslie J, et al. High-risk Merkel cell carcinoma of the skin treated with synchronous carboplatin/etoposide and radiation: A Trans-Tasman Radiation Oncology Group Study - TROG 96:07. J Clin Oncol 2003;21:4371-6. 8. Allen PJ, Bowne WB, Jaques DP, Brennan MF, Busam K, Coit DG. Merkel cell carcinoma: Prognosis and treatment of patients from a single institution. J Clin Oncol 2005;23:2300-9. 9. Veness MJ, Perera L, McCourt J, Shannon J, Hughes TM, Morgan GJ, et al. Merkel cell carcinoma: Improved outcome with adjuvant radiotherapy. ANZ J Surg 2005;75:275-81.